1Blocker has been featured in The New York Times, TechCrunch, and many more. 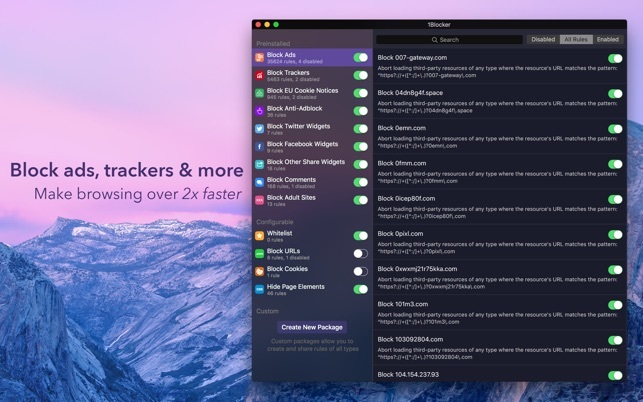 • “Switched from Ghostery to 1Blocker for macOS Safari, which uses the fast new content-blocking API, and it seems noticeably faster.” - Marco Arment. 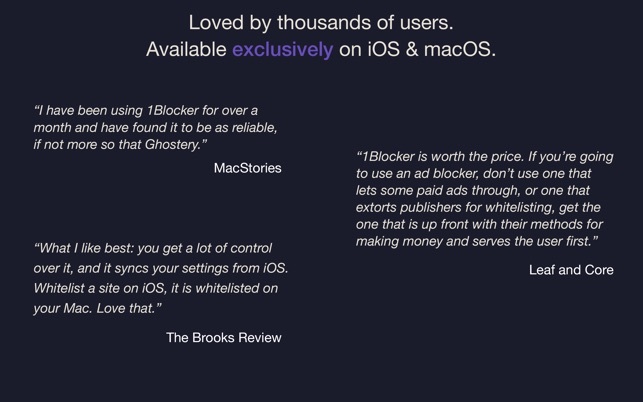 1Blocker is also available for iOS in the App Store. Send your feedback at @1BlockerApp on Twitter or email dev@1blocker.com. Happy Safari browsing, friend! You are going to like surfing the web again. I’ve been looking for something better than Ghostery to allow me to block trackers and the most heinous of ads without blocking “acceptable ads.” Having run an indie site before, I’m not interested in completely depriving publishers of revenue, I just don’t want my computer mining cryptocurrency behind the scenes or loading ads that try to circuvent privacy protections in the browser. 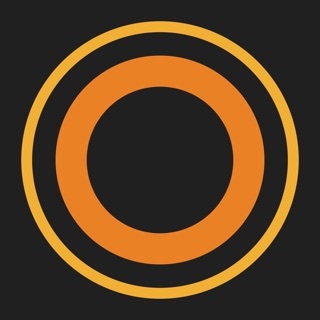 It appeared 1Blocker could do this on iOS, so I went ahead and bought the Mac version. I soon discovered the only way I could enable most normal, unobtrusive ads was to go through tens of thousands of poorly labeled rules and turn them on and off one at a time. Synchronizing this with the premium iOS version promised to help, since the iOS version lets me do bulk enabling or disabling of rules, but the sync is broken and whatever I set on that side gets reset and never synced to the Mac. So, I’ve bought 1Blocker for both macOS and iOS and can’t use either. The developer isn’t very responsive, but did suggest I ask Apple for a refund after several months of me trying to reach out. Apple didn’t issue the said refund, unfortunately. The 1Blocker Button is giant security red flag. I understand the desire to have a button to easily whitelist a site or pause blocking, but I also understand Apple's reasons for reserving that ability to themselves, so third parties (like 1Blocker) can't SEE EVERYTHING THAT IS ON EVERY PAGE YOU VISIT IN YOUR WEB BROWSER, INCLUDING PASSWORDS! If the content blocker is bothering you, you can right click on the address bar and ask Safari ti reload without content blockers. 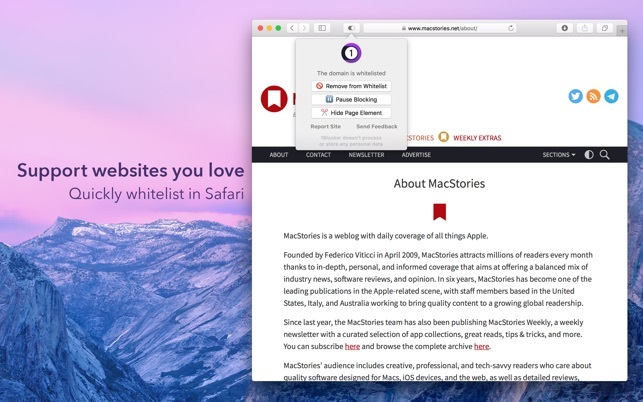 If it is a perennial thing, you can turn it off by page or domain in Safari's preferences. 1Blocker instead asks you to approve an extension for pausing and whitelisting sites, but in order to do so you must allow it to see everything on every page, sensitive data such as passwords included. I don't care if you know Salavat Khanov (the developer) personally, even if he is 100% trustworthy, he's made a hole in Safari that others may exploit. So - I run it without the button. It has lots of customizibility, iPhone client, pretty frequently updated. If you don't understand, and don't want to play with white lists and partial blocking etc, you are probably better off someplace else. Thank you for your feedback, we understand your concerns about this extension, that's why we don't insist that 1Blocker Button extension must be enabled. I just wanted to mention that we use this permission in order to get information about the current tab's domain when you select the whitelist option. The thing is that there's no technical way to request just this functionality from the system, so we have to request full access to webpage content (which may include your sensitive information). However, we understand how important this data is and only use the domain. We do not transmit or process your data in any other way. 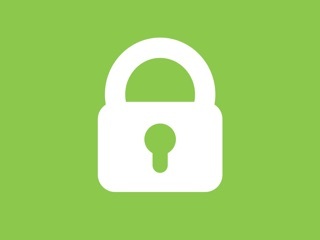 Does a good job of blocking however the new iOS app is named 1Blocker X with a different icon while this one uses the old branding from the legacy iOS app. I'm really confused why there's a difference. There's also some cloud syncing issues. For example if you change a setting on your iphone you'll have to also open 1Blocker on your Mac so that it can sync and reload the rules properly. Thisi can be annoying if you change your rules frequently. Otherwise this has very powerful regex rules along with social blockers that other apps just don't have to my knowledge. The blocking itself is very good. Thank you for sharing your feedback with us! 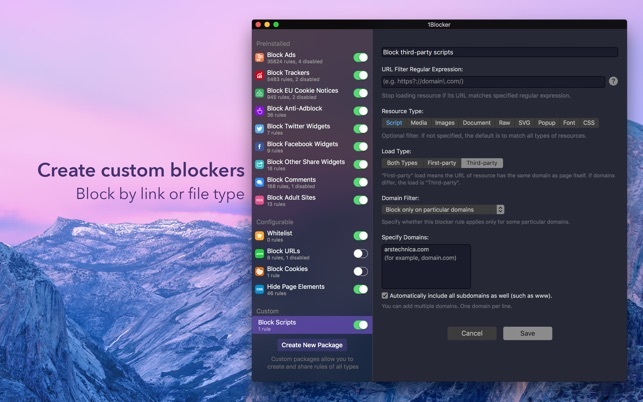 I agree that it might be confusing a little bit at this moment, but I can assure you that we are working on a new version of 1Blocker for macOS right now. It will be fully compatible with 1Blocker X for iOS. We hope that you will like it:) Please, stay tuned for upcoming updates!